Keep costs low and productivity high with this highly reliable A3 business inkjet MFD with a fast FPOT for small to medium workgroups. Deliver results for your business while keeping your electricity bills to a minimum, reducing environmental impact and improving CSR reputation. Not only delivering everyday A4 documents quickly, it also opens up a range of uses for A3 documents, such as in-house leaflets, brochure drafts for proofreading, Excel spreadsheets, construction site plans, worksheets for classrooms, booklets and much more. Don't wait for prints with no warm up time and a fast First Page Out Time (FPOT) of 5.5 seconds. 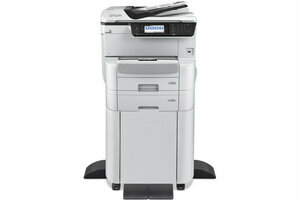 Print up to 11,500 pages in monochrome and 8,000 in colour without changing supplies with large ink cartridges. Print on a wide range of media including recycled paper, glossy media, envelopes and labels. Benefit from low-power consumption due to the no-heat technology of inkjet printing, along with no ozone emissions. Also, fewer replacement parts are needed, such as fusers, drums, developers etc, unlike a laser. A range of software and tools provide secure print options, efficient scanning and help manage devices remotely. NFC and wireless connectivity also supports printing from mobile devices. And with its smartphone inspired user interface and touchscreen, it's intuitive to operate. Epson Open Platform and our work with ISVs add extra solutions, such as PaperCut print management software. footnote1 Approx. page yield. Actual yield will vary depending on images printed and usage conditions. For more information visit www.epson.eu/pageyield.